– A Guided walking tour and A guided bus tour of the Historic Town Centre departing at 2:30pm. Signing up on the day at the site on a fist come first served basis, from 2pm at the Tours stall. 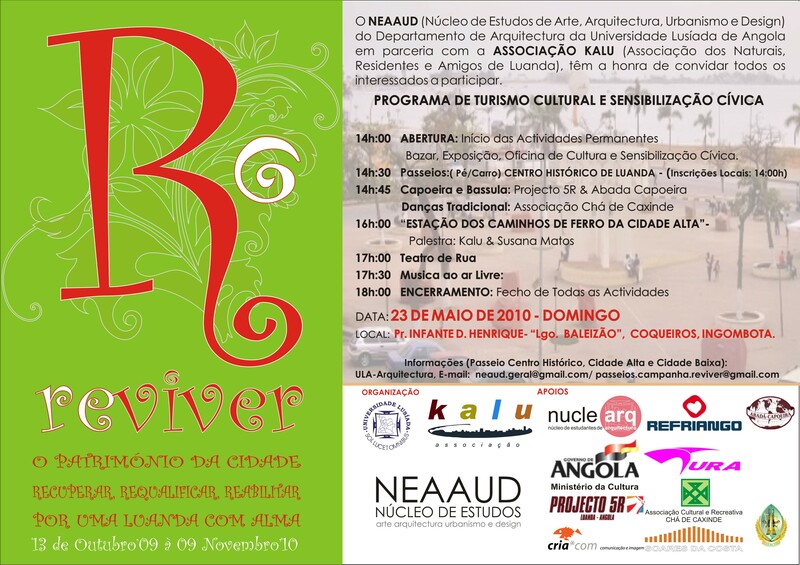 BRING YOUR CHILDREN AND FRIENDS AND take THE OPPORTUNITY TO be PART OF this INITIATIVE THAT promotes the REHABILITATION OF the HISTORIC TOWN OF LUANDA. SPREAD THE WORD, so that THE MAXIMUM number OF CITIZENS, RESIDENTS AND FRIENDS OF THE CITY OF LUANDA TAKE NOTE OF OUR CAMPAIGN. Da Polonia, envio votos de exito desta campanha. antigo embaixador da Polonia em Angola (2003-2006).